You, Me and Dupree « Be Happy!…Be Encouraged! « Have You Hit Rock Bottom? What an interesting film. Just watched it on my home theater. 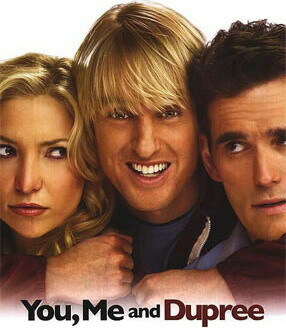 Was expecting it to be a lot more humorous especially with one of my favorite comedians in it–Owen Wilson. That lovable looser with the broken nose, 100 dollar smile, crazy-loser, cocky-funny, womanizer, and all round nice guy. What I really liked about the film most, was Dupree’s (Owen Wilson) speech to the children on “career day”, especially when he didn’t have a job. It conveyed a very nice message which I found strangely relatable. Some of you readers might understand. Sometimes I get the feeling that in a way, I too still seem to be waiting for that “mothership”! When I’ll know my purpose or thing that I’ll really do well and what will be of greatest use to others and the world. On the other hand maybe God just wants me to keep plugging away with what He has given or gifted me with even if it doesn’t seem like much, putting the pieces of my life together–like a jigsaw puzzle without the picture. Slowly but surely, piece by piece in the end I’ll see the masterpiece he had intended for my life all along. Hey, how are you? First of all, thank you for giving me the opportunity to come talk to you all on career day. Now, I’m not Mr. Carl Peterson and I don’t have a career per se. I guess you could say my career is living and loving and I do that to the utmost. I see all you fresh faced “kidlets” sitting there in your neat little rows and you’re all just pods. Pods waiting for your instructions. Now some of you are gonna get zapped right away and be 15 year old prodigies, little midget Olympic gymnasts with their pictures on cereal boxes. Some of you will go on to college and you will find your rhythm there and then go chase down the titans of industry or maybe straighten out our problems at the UN. But some of you…and this is the group that no one ever comes into career day and addresses, and it’s criminal (not too)…some of you, are just going to float along.–Eating spicy foods, humming black people’s music into your thirties—well into your thirties….languishing. This group of pods is going to do a lot of languishing and you’re going to take some heat for it…sadly, you will. Europe is a little easier, it seemed to understand a little better, so did South America. I went to Argentina one time and everyone just seemed to be sitting around and it was beautiful. But that’s ok! Stay loose, stay liquid, laugh a lot–but be ready! That’s what Dupree is doing in his life’s little pod–staying nimble, until I get the call from the mothership. Then I bite. Then you’ll see Dupree coming in here throwing seven different kinds of smoke. Boom, bam! …That’s fine, pods that were supposed to hear this, did, and it will kick in when it needs too. I’m done here. This entry was posted on August 9, 2007 at 6:34 pm	and is filed under destiny, happy, mothership, owen wilson, you me and dupree. Tagged: Career Day Speech, destiny, Me and Dupree, Movie, You. You can follow any responses to this entry through the RSS 2.0 feed. You can leave a response, or trackback from your own site. Yep, I agree with everything in that last post. You & me are pretty similar bro. Rock on. It is many years after the event, but I was looking today for the transcript for Dupree’s speach and so here I am! This is my favourite filme, I cannot tell you how many times I watch it. I am one of those pods, I’ve never had a life’s purpose and I only wish I’d been a bit younger than 32 when I first heard this talk and that it was OK to just stay loose!